Venous thromboembolism (VTE) is associated with high morbidity and mortality both in and out of the hospital setting, and is one of the commonest reasons for hospital attendances and admissions. Designed as a practical resource, the Handbook of Venous Thromboembolism covers the practical aspects of venous thromboembolism management in short and easily followed algorithms and tables. This important text helps physicians keep up-to-date with the latest recommendations for treating venous thromboembolism in clinic-oriented settings. Experts in fields such as the radiological diagnosis of pulmonary embolism and thrombophilia testing, give a succinct summary of the investigation, diagnosis and treatment of venous thromboembolism and include evidence-based guidelines. 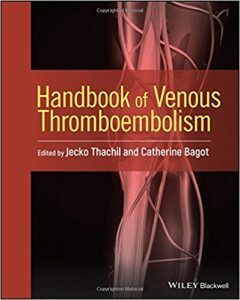 Written for hematology trainees, emergency and acute medicine physicians, junior doctors, and primary care physicians, Handbook of Venous Thromboembolism covers the basics for treating patients with venous thromboembolism and offers guidelines from noted experts in the field.